This is a notoriously beautiful and hard single track on the Colorado Trail. But it is not always referred to by this name. Rolling Mountain Pass is the highest point on the Colorado Trail between Molas Pass and Bolam Pass. On a large scale map it may not look very long. All the zig and zags get averaged out. But many of them are stream crossings, making the route longer than it may appear to the uninvolved observer, especially timewise. The name "Rolling Mountain Pass" has come into usage only since the 1990s, since the construction and publicizing of the Colorado Trail, even though a trail crossed the pass much earlier. Even now, no signs or official maps refer to the pass by this name. It is identified in Helmuth's book "Passes of Colorado". The profile below has more than the usual inaccuracies because the trail is not marked completely on my old topo maps, and when I rode it, I was gpsless. In particular the slope before point 5 is probably not as steep as indicated. Also I remember more severe up and down sections between points 8 and 9. 01. (9770ft,mile00) START-END EAST ALTERNATE: junction between Molas Pass road and unpaved Lime Creek Road. 06. (12300ft,mile15) Colorado Trail joins Rico-Silverton Trail. Continue left up to pass. 07. (12484ft)mile15) TOP: Rolling Mountain Pass. Colorado Trail diverts from Rico Silverton Trail again. 09. (11250ft,mile24) START-END WEST ALTERNATE: Leave Colorado Trail and pick up Bolam Pass road downhill to left. 10. (9130ft,mile31) junction with Hotel Draw (Scotch Creek) road from right. Continue downvalley straight. 11. (8890ft,mile33) START-END WEST: Hermosa Park. From East. The profile starts at the low point between Molas Pass and Coal Bank Pass and climbs the former. The initial section of the trail, leaving Molas Lake above Molas Pass, is free of rocks, except for the occasional lip of sedimentary rock crossing the trail like a step. During morning hours Engineer Mountain to the south is perfectly lit and prime location for the first thunderheads of the day. The trail zig zags above treeline in a gentle grade, so that major effort can be conserved for later sections. Crossing the Lime Creek drainage, you have a good view of the starting point of the profile, the low point between Molas Pass and Coal Bank Pass. Finally approaching Rolling Mountain Pass, Engineer Mountain Trail takes off across the wide and sweeping tundra in a southerly direction, while the old Rico-Silverton trail joins the route from South Mineral Creek. In the background is a large monolithic block of a mountain. From West. (described downwards). The scenery on this side is even more vertical than on the east side. Switchbacks lead towards the edge of a shelf, with the route down remains a mystery for the time being. The trail edges through the forest above the shelf in order to cross Cascade Creek on a bridge, constructed so solid, it could carry a road. The next section is uphill and rocky, and in my case was also the cause for the most walking during the ride. Instead of descending into the depths below, the trail climbs several more forested ridge lines, alternating down and uphill sections. Shortly before approaching Bolam Pass, the trail crosses onto the west side of the ridge line for the first time, and offers a new impressive viewshed, the San Miguel Mountains containing Mount Wilson and Lizard Head Peak. Staying left at two successive forks leads to the Bolam Pass road, slightly east of its summit. From East. Another way to approach this pass from the east is via the Silverton-Rico Trail. This option involves a good deal of walking and carrying, but offers the advantage of a shorter loop trip without the long return on pavement. The South Mineral Creek road leaves the Red Mountain Pass paved road about 2 miles outside of Silverton on the left. During July and August the initial miles up the valley not only pass jagged peaks, but, in my case, also three major transient communities. Parked side by side, as close as townhomes in the suburbs, owners of behemoth camping buses are apparently waiting for the price of gas to return to below three dollars before they can move again. Meanwhile they are using yet other motor vehicles, towed here from distant parts of the country, in order to maintain the habit of consuming as much gasoline as possible. The transient community seems devoid of people. Maybe some are inside their motor homes watching TV, delivered from an array of ballasted satellite dishes, looking like listening posts from a foreign army invading the wilderness. The last of these camping cities offers a chance to refill water bottles. The road here takes a twist upwards and becomes much too steep for the "touring rock band style" buses with their painted flying eagles and colorful pictures of Elvis. The double track trail emerges above treeline and levels out on a very rocky stretch. It then descends back to South Mineral Creek to a pleasant bowl shaped park, ringed by Fuller Peak, Beattle Peak and other 13ers. At this point a hiking/single track trail turns south, in an apparently straight shot towards Rolling Mountain Pass. The trail is marked by a sign permitting bicycles and prohibiting motorized travel. However, not all trails open to bicycles are bicyclable. An initial rocky stretch through forest and over creeks gives way to a super narrow single track above treeline. Then the trail begins to traverse up the right side of the valley, and carrying the bike becomes sometimes necessary. The Rico Silverton Trail actually crosses the Colorado Trail shortly before the summit, in order to meet up with it at the very top, making this a totally separate approach to the pass. Dayride with this point as highest summit. Rolling Mountain Pass , FR578 s(u)? , Coal Bank Pass : Lime Creek Rd near its jct with Molas Pass Rd > Molas Pass(shp) > Colorado Trail west > Rolling Mountain Pass > near top of Bolam Pass(shp) > FR578 > FR578 s(u) > Purgatoire ski area > Coal Bank Pass > back to starting point: 54 miles with 7800 feet of climbing in 8.5 hours (m3:05.09.05). Notes: It's easy to forget about the climb on FR578. I ran out of time and crossed Coal Bank Pass in complete darkness. During daylight it would make sense to substitute unpaved Lime Creek Rd for Coal Bank Pass. Notes: This ride does not actually cross the pass, since both approaches come from the east. - Besides the 5.2 hours measured by the bike computer, there was additional time spent carryig the bike, that the computer did not measure. The actual time for the ride was also quite a bit longer because of waiting out storms and small portages. Also spent part of the day with an "on foot" scramble to the top of a small mountain above the pass. Rolling Mountain Pass is an early historical pass that is often overlooked, probably because the designation, even today, is not very widely used. The Rico Silverton Trail, crossing the pass, was used in the 1880s to supply the emerging mining camp of Rico with supplies on mule trains from Silverton. The pass diminished in importance when Ophir Pass was opened to the north. 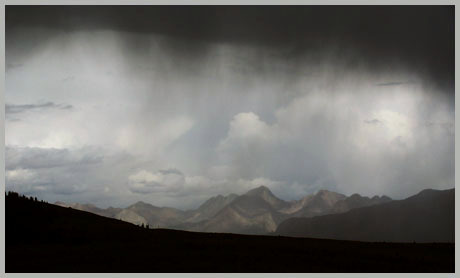 Ophir Pass was better suited for heavy supplies. The Rico Silverton Trail is the alternate eastern approach described above. It continues down the "from west approach" as far as Cascade Creek. There it diverges from the Colorado Trail, in order to cross another unnamed pass west to Rico.